In this post I am going to explain how I have developed a simple AI system for the enemies of my final project on technical college. The idea is a simple script that made the enemy’s walks randomly on the on the scene, chase and attack the player. The IA script that I developed is based on several games, especially in stealth games. 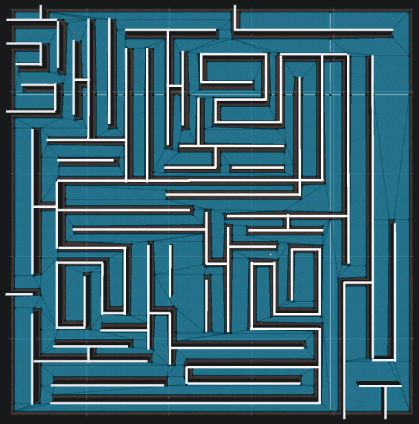 The enemy will select a random destination when the game is started and will walking in this direction, when he comes close to the selected random destination, and another random destination is selected and it starts all the process again. 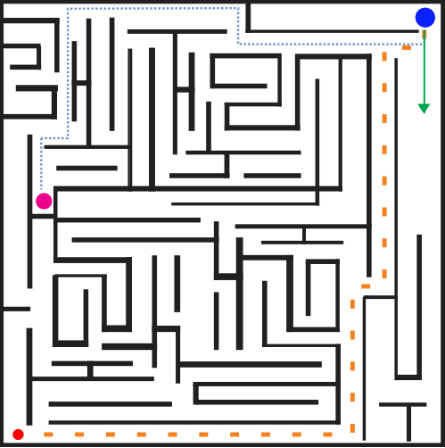 If while he is walking toward a point he sees the player, he starts chasing the player and if he reaches the player, he is going to attack attack him. For this example I will use Unity 5 game engine but you can easily make changes and use in other engines like Unreal. I will not explain basics features of Unity in this post or programming logic, If you have any question please read the reference links or ask me here or on my Twitter. 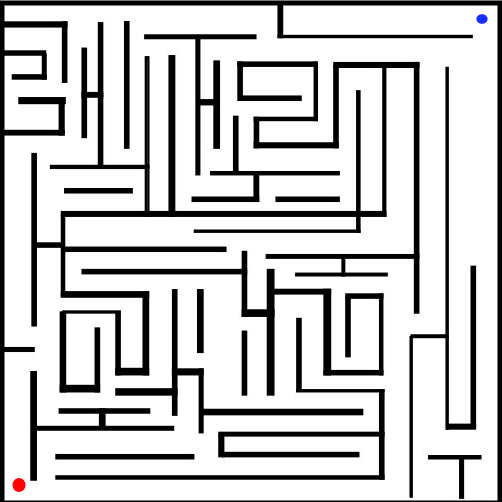 For this example I have build a simple maze using 3D blocks and positioned the enemy(blue sphere) on the right top corner and our player on lower left corner (red sphere). Our player its a simple FPSController (You can find this script on Unity Standard Assets), read more here. For our enemy walk on the scene the easiest method is create a navigation mesh on the scene and add a Nav Mesh Agent on the components of our enemy (3D sphere). Pay atention on your navigation mesh, it must be bypassing all walls, if not your enemy will not work correctly. This simple step will make the next things easy. On void update the first thing we need to do is calculate player distance and the random point distance, for this we use Vector3. And declare a RaycastHit, this raycasthit will will ensure that our enemy does not see the player behind walls. You can read about Physics.Raycast here. And walk while our player distance is greater than perception distance. The orange dotted thick line it’s our script calculating the player distance, the blue dotted line it’s the random point distance and the green arrow is our RaycastHit. The next steps is make a lot of checkings to attack, chase, stop chasing and all that stuffs, I will not going into details, but if you have doubts you can contact me as I told above. I really recommend your playerLife be a variable of an script of the player. And now we finished our simple artificial intelligence script and you can use for your simple game, study and improve, in a few months I will post the second part explaining how to improve this script, adding field of vision, sounds and etc..
You can view the full script/project on my github, and sorry for the quality of the project/code, I was 16 years old when I wrote this. Thanks guys, see you soon.